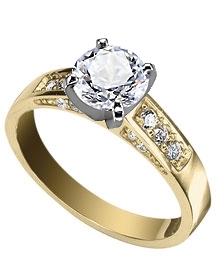 This 14k yellow gold engagement ring has high shoulders to hold 14 round bead set diamonds on its three sides. Each has a color of G-H and clarity of SI. Any shaped center diamond looks good snuggled between its shoulders giving a continuous flash of diamonds on the finger. You choose the center diamond from Danforth's inventory.